Use the following learning objectives to focus your study while reading this month’s Continuing Education article. Describe the top 10 advantages of metal building systems design and fabrication. Examine the benefits to building owners and occupants of the IAS AC472 program, Accreditation Criteria for Inspection Programs for Manufacturers of Metal Building Systems, offered by the International Accreditation Service (IAS). Identify metal building structural components and their corresponding applications. Explain how the Athena Impact Estimator can be used to quickly determine the sustainable benefits of metal building designs. Compare and contrast today’s metal buildings to the metal building systems of the past with regard to design options and construction processes, and what they offer in terms of quality, versatility, sustainability, and constructability. Metal building systems are engineered steel-framed buildings that use a combination of cold-formed steel and welded plate sections to form their structure. These elements are part of a carefully designed system where the steel used is highly optimized, such that there is virtually no wasted material in the final structure. Each system is unique—custom-designed and engineered, produced by the manufacturer, and then assembled on the construction site. Interface with Computer-Aided Design (CAD), along with the ability to clad the buildings in brick, precast concrete, stone, wood, architectural metal, or glass, allows great flexibility in design aesthetics. A metal building model is unique because it is a design-build-type model that is based on process and critical path. Current uses of metal building systems include shopping malls, retail centers, offices, manufacturing plants, warehouses, recreational centers, and many other low-rise building end-uses. What distinguishes this type of construction today is its surprising aesthetic variety, due to the flexibility allowed through different combinations of the system’s basic elements, as well as the ability to clad the buildings in various materials, including brick, precast concrete, stone, wood, aluminum, or glass. Many architects report that designing with metal building systems has revolutionized the way they think about low-rise building structures. To understand how this perception has come about requires an understanding of the elements and options available in the market today. Do you know that metal building systems comprise nearly 50 percent of the one- and two-story non-residential building market in the United States? The point is that metal buildings are being used more often than other forms of construction because they offer a complete solution. The metal building systems industry came about to fulfill an urgent need to house troops during World War II. The most famous example, the Quonset Hut, was a half-round structure that was easily constructed by unskilled labor using only hand tools, and easily disassembled and transported to new locations as needed. After the war, the first standard metal buildings were mostly utilized for industrial and agricultural purposes. By the late 1960s, the industry had gained a reputation for its economy, speed of production, and delivery. The buildings were being utilized in more applications, such as public facilities, warehouses, and storage structures. Because they were initially simple catalog buildings, they lacked design flexibility. As demand grew from architects, engineers, and building owners for greater design options, manufacturers of metal building systems retooled their factories and began custom engineering buildings for specific end-use applications. The evolution of the metal building systems market paralleled the rise of technology and the use of CAD in the mid-1970s. As a result, the term “pre-engineered metal buildings” became a misnomer. Today, most metal building systems are custom-designed by professional engineers and architects, to the requirements of the International Building Code. Metal building systems design is highly significant for architects today, since design teams can work hand-in-glove with systems manufacturers to custom-design a building to conform to the architect’s vision and building owner’s needs. In addition, the standardization inherent in systems-based buildings makes design, manufacturing, delivery, and building erection possible in as little as two-thirds the normal time for conventional structures. A case in point is the Paraclete XP SkyVenture facility in Raeford, North Carolina. The building houses a vertical wind tunnel, which was the largest of its kind when constructed in 2007. The wind tunnel is more than 16 feet in diameter at its narrowest point, and requires a 2,000 horsepower motor to produce wind speeds in excess of 165 miles per hour. The uniquely designed metal building includes six training rooms and multiple meeting spaces, and is located just a few miles from Fort Bragg, one of the largest United States Army installations in the world. It provides free-fall training for the JFK Special Warfare School attendees as well as the general public. Companies are finding various uses for metal building systems, such as this unique design for Paraclete XP in North Carolina. “We basically designed a perfect environment for training and built it around the largest, fastest, and most advanced wind tunnel in the world,” says World Champion skydiver and operator of Paraclete XP SkyVenture Kirk Verner. Design technology makes this energy-efficient vertical wind tunnel nearly invisible to the public. Banks of exotic, airfoil-shaped aluminum turning vanes are tucked into each corner of the tunnel. If you laid them end to end, they would extend almost three miles. Numerous other advances minimize power consumption and reduce sound output. The structure also sets new standards in metal building design. It provided an economical solution that led to the opening of freefall facilities for sports skydivers all across the United States. 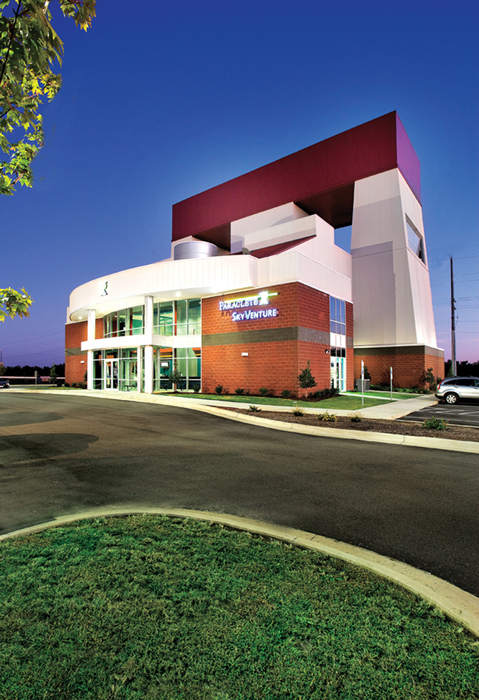 What types of design flexibility can architects incorporate in a metal building? Designers can select straight or tapered columns, solid or open web framing, variable or odd-sized bays or modules, single-slope or double-slope buildings, with centered or off-center ridges, in increments up to 1/16 of an inch. These systems can be integrated with a wide variety of wall materials, such as concrete masonry block, brick, tilt-up concrete, curtain wall, or metal panels. Flat conventional roof design has given way in popularity to a water-shedding design, in which a sloped roof is a key element in the overall image and function of the structure. Size can vary tremendously, from small office or retail centers of 5,000–10,000 square feet up to massive distribution, warehouse, or transportation hubs, some well over a million square feet in size. Car and motorcycle dealerships across North America are primarily using metal building systems because of design flexibility and speed of delivery. The building was completed in three phases over a 20-month period in order to keep the dealership operations running. The first phase was an expansion of the lot onto the rezoned property and site improvements. The second phase included construction of the showroom and customer service areas. This work was completed around the old service department. Next, nine service bays were built, and a temporary wall separated the old and new service departments. This allowed for the old building to be torn down with minimal disruption around the fully functioning new building. 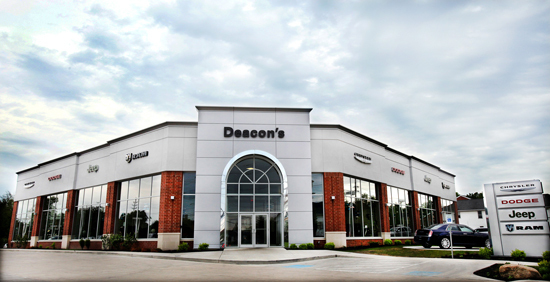 All the construction at Deacon’s was accomplished using metal building systems, including the office, showroom, and service areas. Critical to the engineering design process is determining the environmental loads which the structure must be able to support—including dead loads, roof live loads, roof snow loads, wind loads, seismic loads, and auxiliary loads. The architect should consult local building code requirements. Metal building design engineers adhere to building code requirements which reference ASCE 7, “Minimum Design Loads for Buildings and Other Structures.” In addition, the MBMA Metal Building Systems Manual contains examples of applying ASCE 7 loads to metal building systems. While computer technology has streamlined metal building design, detailing, and engineering, real economies also come through advances in the fabrication of structural elements. Since all elements are factory fabricated, they are precut and pre-punched under precise factory conditions. As a result, quality is increased and waste is decreased. Building erection time and costs are more predictable, since all parts are manufactured and shipped to the site—typically within 6 to 8 weeks from the time an order is submitted. 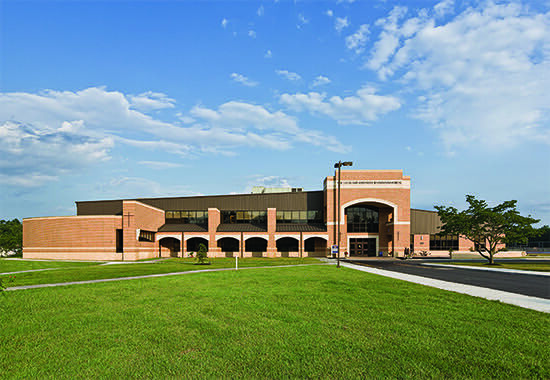 A metal roof with a solar-reflective surface helps reduce air-conditioning loads for the St. Augustine Preparatory School in Richland, New Jersey. With the metal building system, the school has new science labs, classrooms, athletic facilities, a dining hall, chapel, and offices. The clear span provided by the metal building offers plenty of space for the pool, dining hall, and gymnasium. A brick exterior was selected to match existing buildings. A metal roof with a solar-reflective surface helps reduce air-conditioning loads. Solar panels were installed on the roof and can supply 60 percent of the building’s electricity needs. An architectural design professional reaps many benefits from working with a metal building system. First and foremost is the tremendous time savings metal building systems represent when compared to conventional construction methods. The metal building system process provides a consistent design experience for a project team because the building design and delivery are systematic. Highly experienced metal building designers oversee the engineering and structural fabrication, then materials are shipped from a single-source supplier to the jobsite. The building framework is installed by experienced metal building assemblers, which allows for other trades to begin their work faster and in a more consistent manner. Conventional methods require the designers, detailers, and contractors to reinvent the process for each new project, which wastes time. A study published in the Journal of Construction Engineering and Management revealed that up to 50 percent of time on the jobsite is devoted to wasteful activities. These include late deliveries, poor coordination of materials and trades, and correcting field mistakes. The metal building company takes responsibility for the engineering and fabrication of the components it supplies, and works with the Engineer of Record for the project on the design of any other elements of the building shell. It is important for the design professional to ensure that the design criteria, particularly lateral drift and deflection of the primary frame and secondary supports, are compatible with the chosen wall materials and other project requirements. Manufacturers can provide a “letter of certification” with each building that assures the metal building system has been designed in accordance with specified state and local codes or other specific project design requirements. A variety of warranties are also offered for metal building systems. These address various building elements, such as finish warranties on roof and wall systems and weathertight warranties on roof systems. Metal building systems offer a completely integrated set of interdependent elements and assemblies which, taken together, form the total building. Included are primary and secondary framing elements, covering components, and accessories. Primary framing members are usually “tapered” to allow for the placement of steel where it is critical for maximum strength and can be very cost-effective compared to conventional steel design where members must be of a constant depth. These integral parts come in many different configurations, as illustrated below. Rigid frame clear span: Twenty feet to 160 feet and wider. 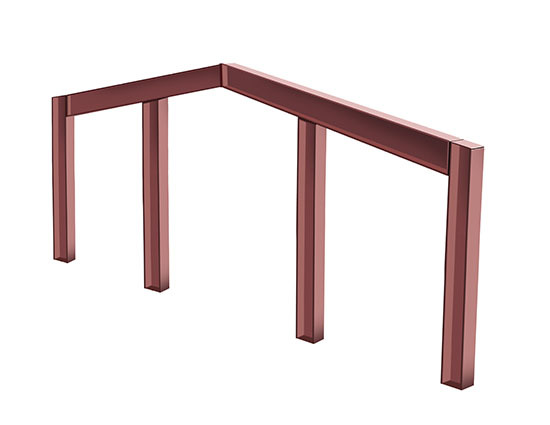 Provides a column-free interior space. 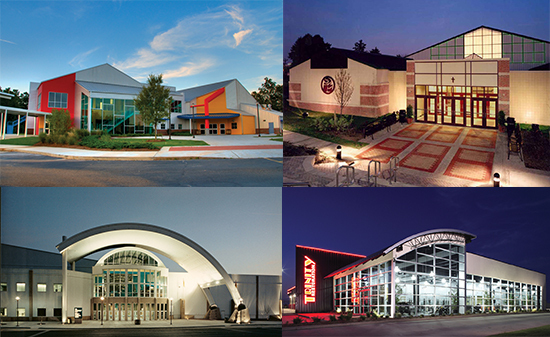 Recommended applications include auditoriums, churches, gymnasiums, ice arenas, warehouses, and aircraft hangars. Specific column and rafter depths are available for desired clearances. 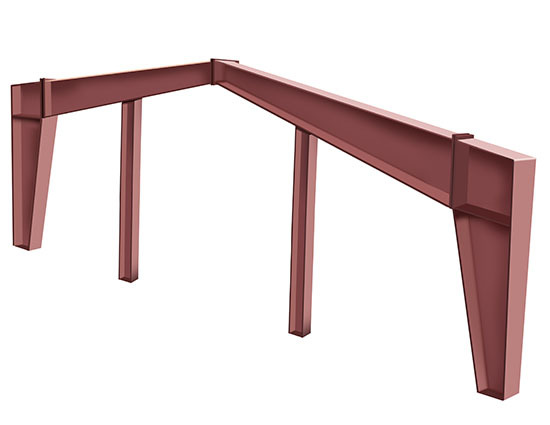 Ridge frame multi-span (solid web rafter) and modular open web (open web rafter): Fifty feet to 500 feet and wider. Used where interior columns do not impair the function of the building. Interior columns shorten the spans of the rafter beam, thereby often reducing the frame cost. Recommended applications include manufacturing facilities and warehouses. Flush wall clear span: Twenty feet to 70 feet and wider. Offers column-free interior floor space and uniform depth columns. The secondary wall structural systems (girts) are flush with the interior flanges of the columns. This allows interior sidewalls to be finished without the frame columns protruding into the interior wall line. Recommended applications include retail stores, banks, car dealerships, and hockey rinks. 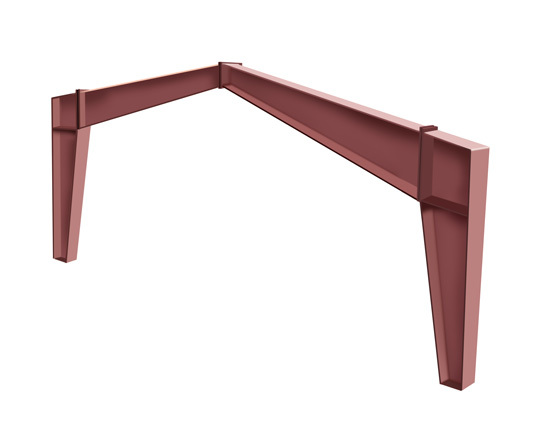 Flush wall multi-span: Fifty feet to 250 feet and wider. Available with solid or open web rafters. Uniform depth exterior columns with girts are flush with the inside column flange. Interior columns reduce span lengths, thereby reducing costs. Recommended applications are buildings where interior sidewalls will be finished for office areas or for warehouses and distribution centers where close-to-wall palletizing is required. Tapered beam straight columns: Fifteen feet to 70 feet and wider. Clear span with uniform depth columns. Greater vertical and horizontal clearance at column/rafter connection than rigid frame clear span. This system is economical for narrow widths. Recommended applications include offices, retail stores, fire stations, and buildings with bridge crane systems. Single slope clear span: Twenty feet to 160 feet and wider. Available with solid or open web rafters. This system provides single direction roof slope for rainwater runoff control. It is often used for shopping centers and office complexes where rainwater must be directed away from parking areas. 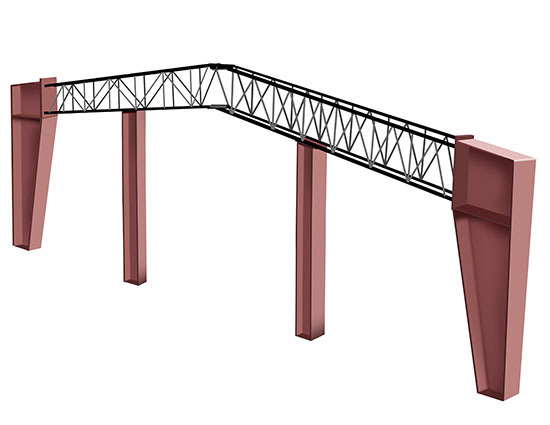 Single slope multi-span: Fifty feet to 200 feet and wider. Available with solid or open web rafters. The single-slope design diverts rainwater runoff. This system is used in facilities where interior columns do not impair building function. Recommended applications include manufacturing, warehousing, distribution centers, retail shopping centers, and office complexes. Lean-to: Ten feet to 60 feet wide. Used primarily for wing units and additions to existing facilities. A lean-to can be used with any of the above framing types. Wall systems typically consist of metal wall panels and girts. Girts are cold-formed “C” or “Z” shaped sections and are attached to the columns of the primary frame to support the wall panel against lateral loads. They may frame into the column webs or be attached to the outer column flange. Flush framing increases usable building floor area. The panel and girt act in concert to resist pressure and suction placed on the system by heavy winds. Continuous spanning (lapping) girts are available to provide additional economy. Varying wall member depths and material thickness are offered for flexibility of design, allowing deeper members to span greater distances economically. Metal wall panels are available in many gauges and textures, some with embossed or stone-coated metal that replicates the look of stucco. Manufacturers will stock standard colors and can obtain special colors from their suppliers to match architectural requests. Often, the exteriors of the metal panels are integrated with other materials—such as brick, precast concrete, glass, stone, or wood. Two primary metal wall options are available, which are field assembled or factory insulated metal panels (IMP). Other traditional load bearing or facade wall materials can also be used, such as tilt-wall or concrete masonry units (CMU). Field assembled systems: This system provides metal exterior panels and insulation (typically fiberglass) and may include interior metal liner panels. Advantages include rapid erection, cost-competitive materials, and quick and easy panel replacement. Openings for doors and windows are created quickly. In addition, the panels are lightweight, so lifting equipment is not required—nor are large foundations or heavy spandrels. Acoustic surface treatments are easily and affordably added to interior panel walls. Insulated metal panels: This system consists of an outer panel and an interior face formed over an insulating core, usually a foam material. It is normally fastened outside the girt. Panels providing insulating values are available from manufacturers. This system incorporates a hard surface interior metal liner panel, rather than exposed faced-fiberglass, and is normally fastened to the building using concealed fasteners to produce a clean appearance. Two types of fastener systems are available: exposed fastener or concealed fastener systems. Exposed fastener systems: Panels vary in depth and are available in widths of 2 feet to 4 feet. Thickness ranges from 26 gauge to 20 gauge steel (a lower number indicates thicker material). The most common wall panel thickness is 26 gauge. Wall panels are attached to “C” or “Z” girts with self-tapping screws, self-drilling screws, or expanded fasteners, and joined to each other at their sides and ends in lap joints. 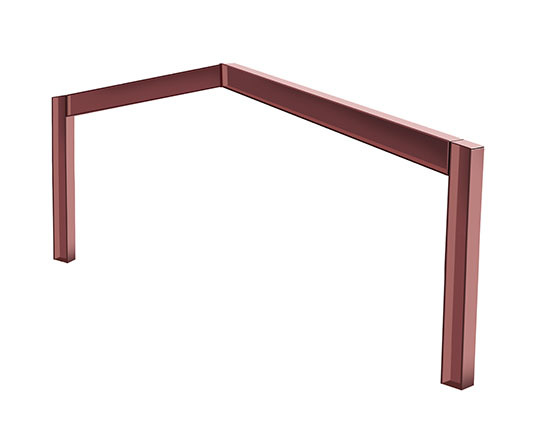 Profile panels range in depth from 1 inch to 2 inches and are available in widths from 28 to 40 inches, and are available in varied patterns and colors. Concealed fastener systems: Designed with edge joints that conceal the fasteners, the panels are available in many different profiles and finishes. These panels usually have deeper cross sections and can allow longer spans between girts. Roof systems are made up of two components: purlins and roof panels. Purlins: Two types of purlins support the weight of the roof and any applied loads—cold-formed steel (either “Z” or “C” sections) and open web joists. The purlins work to transfer these loads to the primary structural system. 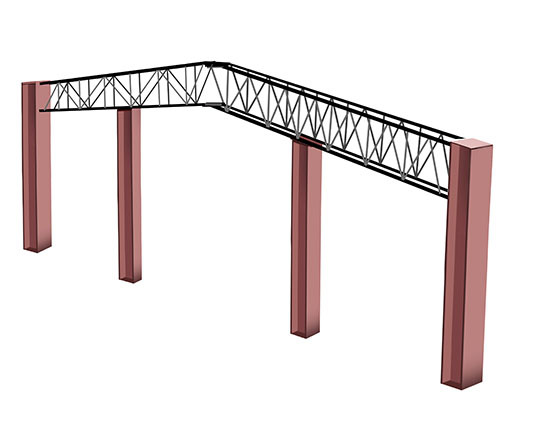 The “Z” or “C” sections can be simple spans but are more commonly used as continuous beams between frames. They can be used for spans of up to 30 feet. Continuous span (lapping) purlins are used for greater economy. 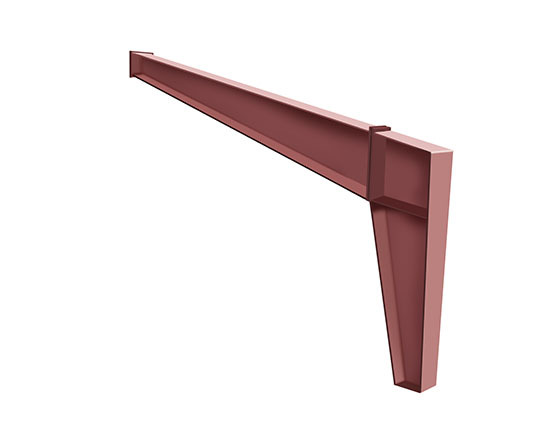 For spans greater than 30 feet, open web steel joists or deeper “Z” sections may be used for purlins. Varying roof member depths and material thickness are available for flexibility of design, allowing deeper members to span greater distances economically. Open web steel joists are utilized as simple spans and allow for greater spans. 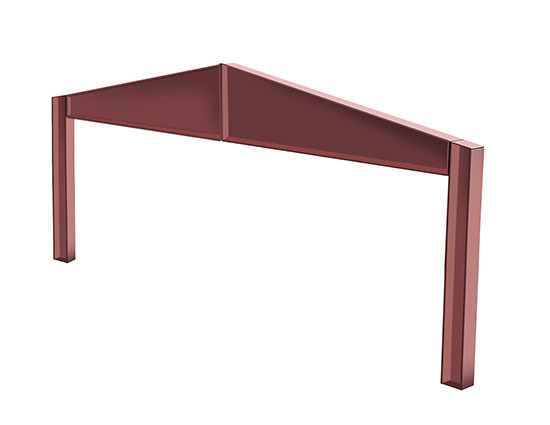 Hot-rolled bar joists or cold-formed long bay purlins can be used to span up to 65 feet. Roof panels: Panels are fabricated from light gauge steel as a lap seam roof or a standing seam roof system. The panel of a lap seam roof is typically 1 inch to 11/2 inches deep, 26 or 24 gauge (or heavier) in thickness, and connected together by lapping the panels. A sealant is installed between the panels at the side laps and end laps and secured with fasteners. These systems are also known as “through-fastened” roofs because the structural panel fasteners are exposed. The selection of panel depth and thickness is affected by the roof load, purlin spacing, and insurance considerations. Standing seam panels: The seam between two standing seam panels is often made in the field with a machine that produces a cold-formed, weather-tight joint at the side lap of each panel. The panel is attached to the purlins with a steel clip concealed inside the seam, which creates a secure attachment while permitting thermal expansion and contraction of the roof plane. Since most of the through-the-roof fasteners are eliminated, a continuous, single-skin membrane results. Thermal spacer blocks, made from high R-value foam insulation, can be placed between the panels and purlins to provide a consistent thermal break for energy compliance. The metal standing seam roof can be used to renovate and restore old, leaking flat roofs, upgrading them to better-than-original condition by adding a slope. This simple procedure immediately turns a flat roof into a water-shedding surface. Various finishes and colors allow architectural variety, with typical gauges ranging from 24 to 22. The products can be used in either a structural, low-slope application or to create a signature architectural metal roof design. Bracing requirements: To complete the roof system, metal building manufacturers typically provide bracing for the purlins. Depending on the design assumptions, bracing systems may incorporate steel straps, channels, or sag angles. All of these systems span from purlin to purlin. For a standing seam roof system, the amount of lateral support provided by the panels to the purlins is determined through testing if it is to be included in the design. This is why a standing seam roof system from one manufacturer may have more visible bracing than another. Frame shape and peak location: Both elements can be important components of an architectural design. The majority of buildings supplied today are a traditional rectangular shape, yet many other shapes are possible: L’s, T’s, U’s, and even octagons. The majority of metal buildings supplied are single slope or gable buildings with the ridge on center with the frame. The peak can be moved off center, however, to almost any location on the frame. A single slope building can be positioned with the high or low side facing the front, depending upon drainage or architectural requirements. When frames are specified with multiple ridges or with a valley instead of a ridge, an interior drainage system will be incorporated by the metal building manufacturer. Bay sizes: Almost any bay size is possible today. The architect’s vision can define the solution, with mixed-bay patterns within a building also available. When the building has interior columns, these can be of different spacing patterns as well, ranging from 10 feet to 65 feet. Column shapes: Tapered perimeter columns are often the most economical choice, but straight columns provide custom options to meet project specifications and architectural vision. Perimeter columns are normally fabricated as I-shapes and can be provided with parallel flanges or web tapered. Interior columns can be supplied in many different shapes, including hollow structural shapes, hot rolled I-shapes, and built-up fabricated I-shapes. Column heights: Heights can vary to provide a step-in roof elevation or an in-floor elevation. Accessories: Structural and nonstructural accessories include: insulation, gutters, downspouts, roof ventilators, roof openings, interior liner panels, wall vents, wall openings, windows, storefront glazing of all types, overhead vehicle doors, canopies, skylights, clerestories, fascia, and trim. These elements add aesthetic variety. Expandability: Metal building systems are easily expanded. This usually involves the removal of an end or side wall, the erection of additional structural frames, and matching the existing wall and roof coverings to the addition. Manufacturers routinely perform assessments to add on to a metal building system, including structural and roof drainage analyses. Energy considerations and controlling condensation are important when providing an efficient building. Condensation can lead to long-term detrimental effects, including corrosion and degradation of insulation. Condensation occurs when warm, moist air comes in contact with cold surfaces, such as framing members, windows, and other colder regions within the building envelope. Warm air, having the ability to contain more moisture than cold, loses that ability when it comes in contact with cold surfaces or regions. When this happens, excessive moisture in the air is released in the form of condensation. If this moisture collects in the insulation, the insulating value is decreased since wet insulation has roughly the same heat conductance as water. Condensation problems are most likely to occur in climates where temperatures frequently drop below 35 degrees Fahrenheit over an extended period of time. Monitor the air temperature inside and outside of the building, as well as the relative humidity. Install an integral vapor retarder on the warm side of the assembly (under winter conditions). The main function of the vapor retarder is to slow down the flow of moisture through a roof or wall assembly. Permeability is measured in perms. The lower the perm rating, the more effective the vapor retarder is. A 0.10 perm rating (minimum) is recommended for normal building conditions. Install sufficient insulation between the outside skin and the vapor retarder to keep the temperature of the vapor retarder above the dew point temperature inside the building. Consult a mechanical engineer to properly size the HVAC system to assure adequate ventilation and humidity control while considering the end-use and insulation level of the building. Today’s buildings are much tighter in terms of air-leakage due to changes in energy codes and project specifications. HVAC equipment must be properly sized to account for moisture removal in addition to temperature control, taking into account the building’s air-tightness. Oversized HVAC equipment may handle temperature, but it won’t run often enough to control moisture accumulation. Acoustics: Another important consideration in selecting insulation is acoustics. Both the interior and exterior noise levels can be greatly reduced by several types of thermal insulation. The insulation’s noise absorption properties help prevent the transmission of exterior sound, such as rain, hail, aircraft, and traffic. In addition, insulation helps to quiet noise within a building by absorbing reverberating sound. This is especially important in manufacturing facilities where there may be particularly high noise levels. The type and thickness of insulation both have a large influence on the thermal efficiency of a building because insulation traps still air and slows down conductive heat transfer. Two types of insulation are commonly used for metal building systems: fiberglass and rigid foam board. Fiberglass blankets are the most common type of insulation used in the roofs and walls of metal buildings because of their low cost, fire and sound resistance, and ease of installation. The insulation is often placed on the outside of the purlins and girts and the panels are applied over it, with higher performance systems adding thick insulation in between purlins and girts. In the case of a standing seam roof, a thermal spacer block may be placed over the purlins to reduce heat loss at that location due to the compression of the fiberglass blanket insulation. The American Society of Heating, Air-conditioning and Refrigerating Engineers (ASHRAE) publishes ANSI/ASHRAE/IES Standard 90.1, “Energy Standard for Buildings Except Low-Rise Residential Buildings.” It contains performance requirements for all commercial buildings, including typical metal building assemblies. The performance impact caused by the compression of the insulation is accounted for in the ASHRAE standard, making finding and selecting code-compliant metal building assemblies for any end-use building relatively easy. A second form of insulation is rigid foam board, typically made from polyisocyanurate (poly-iso) foam. Most often, a metal liner panel is installed over the purlins, and then the rigid foam board is laid in place with a vapor barrier. The standing seam roof is installed over it. The roof clips rest on a steel bearing plate over the foam insulation and a fastener is installed through the board insulation into the underlying structure. This is often referred to as a composite roof. Similar details for using rigid foam board insulation are available for metal building wall applications. The Athena Sustainable Materials Institute’s Impact Estimator for Buildings software is used by design teams across North America. It allows them to explore the environmental footprint of different material choices and core-and-shell system options. The Impact Estimator provides a cradle-to-grave life-cycle inventory (LCI) profile for a whole building, including the projected flows from and to nature: energy and raw material flows plus emissions to air, water, and land. The software is available as a free download through the Athena Sustainable Materials Institute. In 2015, MBMA released a study, conducted by Walter P. Moore and Associates Inc., which compared the environmental impacts of a metal building system against other forms of construction using the Athena Impact Estimator software. The study compared the environmental impacts for the structure and building envelope in 10 case study buildings. These included both metal building systems and other forms of construction in three separate climate zones. The purpose of the study was to determine how metal buildings compare to other construction types in a whole building life-cycle analysis. The study showed that, for the types of project where metal buildings are most economical, they typically also perform better in life-cycle analysis and have the least material impact on the environment. Metal buildings performed better than concrete, masonry and traditional steel construction types, especially for long span buildings. Metal buildings also showed lower environmental impacts when comparing structural and envelope materials to load bearing masonry walls, concrete tilt-up, and traditional steel framed construction for structures with the same building footprint and functional equivalence. 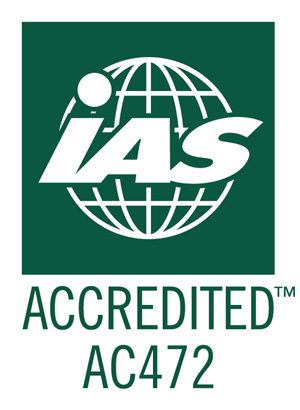 The International Accreditation Service (IAS) is a wholly owned subsidiary of the International Code Council (ICC). IAS developed the Accreditation Criteria for Inspection Programs for Manufacturers of Metal Building Systems (AC472). This comprehensive, third-party accreditation program is based on the requirements of Chapter 17 of the International Building Code (IBC) and provides building owners, specifiers, and code officials with a means to approve the inspection programs of manufacturers that fabricate metal building systems. Monitors manufacturing documents, design and detailing, and raw material usage and tracking. Monitors quality assurance and verifies the credentials of a manufacturer’s technical team, such as licensed engineers, certified welders and inspectors. Requires two on-site plant inspections per year. Manufacturers provide letters of certification and erection drawings for each project.